There are three things in particular that I want to highlight this month that will have ongoing, positive implications for our movement. Certainly, much more can and will be said about each of these topics, but for now quick mentions will be helpful. First, in the opening session, I tag-teamed with Will Mancini to launch some new language around the future vision of ECO. Will and the Auxano team have come alongside of us to help imbed our identity in some common language and to provide a picture of a preferred future. Will, and others, often talk about the five irreducible questions that people and organizations must ask of themselves. At the start of ECO, some of these questions were asked, but not all of them. Therefore, the Auxano team worked with staff and Synod Executive Council, as well as conducted personal interviews with some pastors, surveyed all pastors, and looked at original founding documents to help us more clearly articulate the answer to these questions. I encourage you to watch the talk that Will and I did together at the gathering as well as look at the vision frame document and the summary statement of the 10 Year Vision. I don’t want to rehash in this article everything that was said at the gathering, other than that the core of this vision continues to keep the flourishing of the local church at the core of who we are in the denomination. 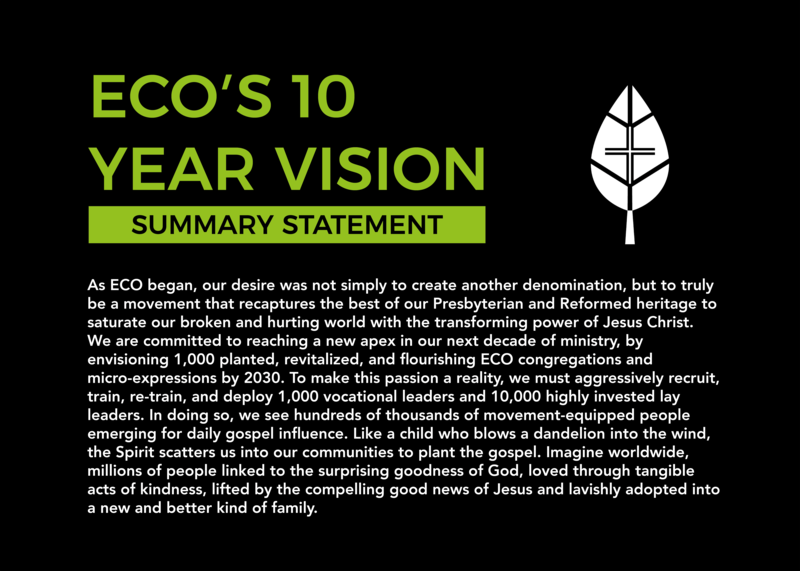 This vision and mission will truly guide the direction of the denomination in the next 10 years. You will hear me and others draw from these documents frequently, so we want to make sure you are at least introduced to them now if you were not at the gathering. Second, we are excited about our new partnership with Gordon-Conwell Theological Seminary. I talked about this partnership in my talk as well, but Gordon-Conwell (Charlotte, NC campus) is going to help us create an extension of their campus on-line for the larger ECO community. Courses will be taught by Gordon-Conwell and facilitated by ECO and ECO-related professors. These courses will be available at three different levels of engagement. First, the larger ECO community can audit these courses for a minimal fee. Second, those in the Commissioned Lay Pastor program can take the course (but if they do not need official seminary credit, the course can be taken for about 25% of the normal fee). Third, if students want to take the course for Gordon-Conwell credit they simply pay an additional fee to have the course transcribed to the Gordon-Conwell transcript. They can then transfer to other schools, complete their degree at Gordon-Conwell, or eventually take the complete Master’s Degree through our online portal. I am excited about many things about this new endeavor! First, our partnership allows us to have a better connection between the seminary, the local church, and the denomination. Second, it allows us to keep theological education as an important part of our training, but allows students to receive that education for a little more than half of the normal cost. Third, we encouraged every church and every leader to think about their Flourishing Next Step in ministry. We were thrilled that over two hundred cards were turned in by leaders who wanted to talk about their church’s Flourishing Next Step in ministry. Some had clear ideas of how they wanted to proceed, others were intrigued by options both within ECO as well as options outside of ECO. The stance that we want to take as a denomination is that we want to provide liaisons to churches to help them take their Flourishing Next Step. We will be having hundreds of conversations over the next couple of weeks to help churches determine how the Lord wants them to move forward, one step at a time. If you were not at the gathering or would like to help your church take its Flourishing Next Step I encourage you to e-mail info@flourishmovement.org to begin the conversation. My prayer is that this year is a helpful turning point in the life of ECO. We have our feet established underneath us and are now in a great place to become the movement that God has created us to be! We can’t wait to see you in Dallas in 2020, as we continue to take Flourishing Next Steps forward in our local churches! We are so excited about what God is doing in and among your ministries in the unique context in which He has called you. ← What is your Flourishing Next Step in 2019?